Eight new world class multimillion euro research centres have received approval in principle from Science Foundation Ireland. However, only four will be able to proceed straight away as there is no funding available for the others. In total €72m will be invested by the foundation in the new facilities over the next six years, with a further €38m coming from 80 industry partners. Confirm, which will focus on smart manufacturing IT and industrial automation systems. Led by Professor Conor McCarthy, University of Limerick. BEACON, which will study biological resources as alternative materials to finite fossil resources. Led by Professor Kevin O'Connor, UCD. Déantús, which will look at innovative techniques and processes in Additive Manufacturing. Led by Professor Denis Dowling, UCD. However, the four others will have to wait until the Government increases the budget for science and research, before they can be allocated multi-annual funding. In total, the four centres have received funding pledges of €60m from over 100 companies. 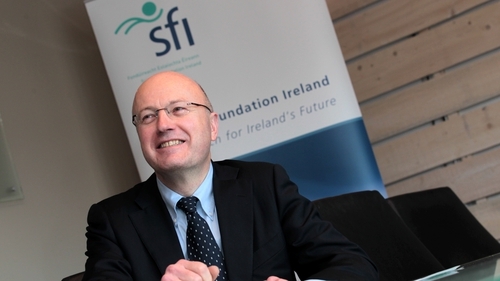 "We need to be ambitious and invest in areas of real potential to ensure our future economic competitiveness," said Professor Mark Ferguson, Director-General of SFI and Chief Scientific Adviser to the Government. "In line with Innovation 2020 we have identified through the SFI Research Centre programme a further four proposals of strategic national importance that meet the high criteria of scientific excellence and impact," he said. "Over the coming months we will be working to seek additional funding to support these four SFI Research Centres that have been approved in principle," he added. Under the science strategy published in late 2015, the Government pledged to increase spending on research and development to 2.5% of GNP a year. So far, though, the budget has only increased by a small fraction of what is required if that target is to be met. Four further SFI research centre proposals were approved in principle by the SFI Board following stringent assessment. SFI is seeking additional funding to support these centres over the next six years. Since 2013 SFI has funded the setting up of 12 other world class research centres in Ireland, which focus on everything from premature baby health, to nanotechnology and software engineering. According to SFI the new centres will do a mixture of basic and applied research, "with strong industry engagement, economic and societal impact". All the universities in the country and many of the institutes of technology and other research bodies are involved in at least one of the centres.